‘General Hospital’ Spoilers: Ryan Helps Franco Get Cops Off His Back After Framing Him For Murders – Serial Killer Getting Soft, Is the End Near? 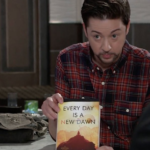 ‘General Hospital’ spoilers relate that there’s a new ally in the Dawn of Day investigation, a lucky break for Griffin Munro (Matt Cohen), and Alexis Davis (Nancy Lee Grahn) is clearly a little more than her new therapist (Neil Byrne, played by Joe Flanigan) planned on. Did you miss all the General Hospital spoilers? Let us catch you up on the highlights with your General Hospital recap. Jason Morgan (Steve Burton) and Sam McCall (Kelly Monaco) may be “broken up”, but they’re definitely still together on this Dawn of Day situation. While Sam talks to Carly Corinthos (Laura Wright) about how deep Kristina Davis (Lexi Ainsworth) is in and how important it is for her to play her part right, Jason’s out of town talking to a member of the Beecher’s Corners chapter, Harmony (Inga Cadranel). Carly, by the way is shocked to learn one of her bartenders is involved in the group, as she wanted her place to be a safe haven for JaSam. Carly’s ready to get Sonny Corinthos (Maurice Bernard) to scare DoD off, but Sam insists that is the worst possible thing to do. Jason’s trip turned out to be a little worrisome for him. Harmony gave off totally creepy vibes the whole time they were chatting, and we find out later that she was behind a not-so-friendly visit from local law enforcement. She smooths over the situation and plays it off as them all looking out for each other, as is the Dawn of Day way, but it’s obvious that Jason has a weird feeling. As he should. She calls Shiloh (Coby Ryan McLaughlin) later to report on everything that was said. Well, we have to say this for Cult Guy—he’s thorough. Alexis is still reeling from learning her therapist is the guy who tried to pick her up earlier, and he offers to give her a referral. After taking the other guy’s card and walking out, she decides that she’s already spilled enough and may as well go all in. After assuring herself he had no knowledge of who she was when he asked her out, she starts spilling her guts. Based on some of the looks he gets on his face, Alexis’ messed-up childhood is way more than he could have bargained for. Word to the wise for anyone new to Port Charles society—anything and everything goes. Like, seriously. After they talk about her Dawn of Day session and her ‘type’, he tells her he’s confident that if she moves forward with treatment, he can help her get away from the completely toxic and weird ‘Daddy Issue’ relationships she describes. She says she’s in. And we’re giving this about, oh, five seconds until they start getting less than professional. In other Griffin news, we find out he’s been boxing in his off time to blow off steam, thanks to a visit from Sasha Gilmore (Sofia Mattsson). She’s, btw, shocked that he’d risk those surgeon hands that way.